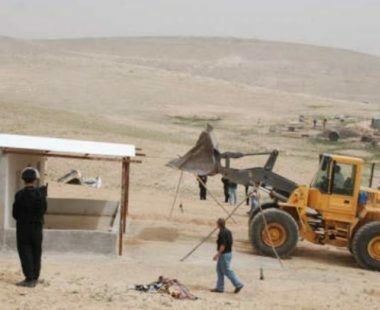 The Israeli Authorities demolished, Thursday, the al-Arakib Bedouin Palestinian village, in the Negev, for the 140th consecutive times, after dozens of soldiers and police officers invaded it. The army, accompanied by bulldozers and machinery, demolished the residential tents and sheds, in addition to all barns, displacing the families along with their children, and leaving them under the rain without shelter. The residents of al-Arakib said that, despite the pain and the ongoing destruction of their dwelling, they are determined to remain on the lands, and will rebuild their village, as they refuse the Israeli place to displace and relocate them. There are about 240.000 Palestinains living in dozens of villages and communities in the Negev, but the communities are not recognized by Israel ad are considered illegal, although they predate Israel itself. Al-Arakib, Umm al-Hiran and Abu Qweider, are among 34 “unrecognized villages” that do not receive any services from Israel and are without basic infra-structure, including running water and electricity.